MORE than 200 basketballers are expected to attend the Under-17 national trials at the Taurama Aquatic and Indoor Centre in Port Moresby from Friday, says an official. An invitation has been extended to associations in PNG and Australia, attracting more than 200 boys and girls to vie for spots in the national training squads. The boys’ and girls’ final squads will attend the Fiba U17 Championships in New Caledonia in August. Basketball Federation of Papua New Guinea president Nick Daroa, pictured, said parents had responded positively to meet their children’s travel and accommodation costs. Daroa said the reason was that the men’s and women’s five-on-five and three-on-three squads would also train at the centre this weekend. “I’m proud that parents have made the commitment to meet all the costs for the children to attend the trials,” Daroa said. “We also had good responses from Australia, with parents committed to accompanying their children to Port Moresby for the trials. Daroa said the trials will be about focusing on drills and skills. After hosting the Fiba Oceania Championships in Port Moresby last year, the U15 national sides are likely to dominate the squad but “players should work hard to earn their spots”, Daroa said. 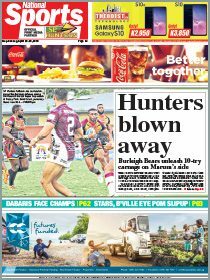 He said PNG men’s head coach Joel Khalu and others would assist with the trials. Meanwhile, Australian-based players such as Martineng Leahy, Christian Pang, Liam Wright and Aaron Palmer are expected to attend the five-on-five and three-on-three training. Lloyd Wright is contracted to the Cairns Marlins but will join the national side in June before they depart for Samoa. The Javapro sisters, Madeline and Pennina, are also expected to attend the training. “We are monitoring all our overseas and local players,” Daroa said.